With below average temperatures and snow, wheat growth and development is slower this year compared to the previous two years. Last year, wheat in Pickaway County reached Feekes 6.0 growth stage the last week of March. Remember, exact growth stages cannot be determined by just looking at the height of the crop or based on calendar dates. Correct growth identification and knowledge of factors that affect grain yield can enhance management decisions, avoiding damage to the crop and unwarranted or ineffective applications. Feekes 6.0, the nodes are all formed but sandwiched together so that they are not readily distinguishable. At 6.0, the first node is swollen and appears above the soil surface. This stage is commonly referred to as “jointing.” Above this node is the head or spike, which is being pushed upwards eventually from the boot. The spike at this stage is fully differentiated, containing future spikelets and florets. Feekes 8.0- Flag Leaf Visible, but Still Rolled Up: This growth stage begins when the last leaf (flag leaf) begins to emerge from the whorl. 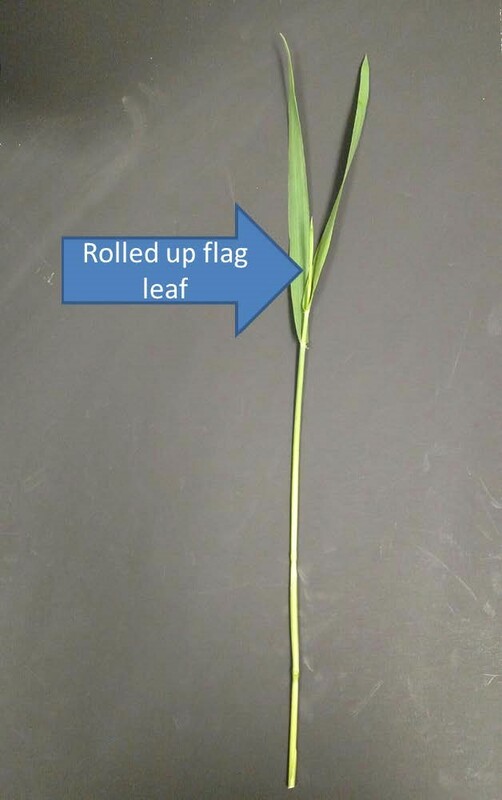 This stage is particularly significant because the flag leaf makes up approximately 75 percent of the effective leaf area that contributes to grain fill. It is therefore important to protect and maintain the health of this leaf (free of disease and insect damage) before and during grain development. When the flag leaf emerges, three nodes are visible above the soil surface. 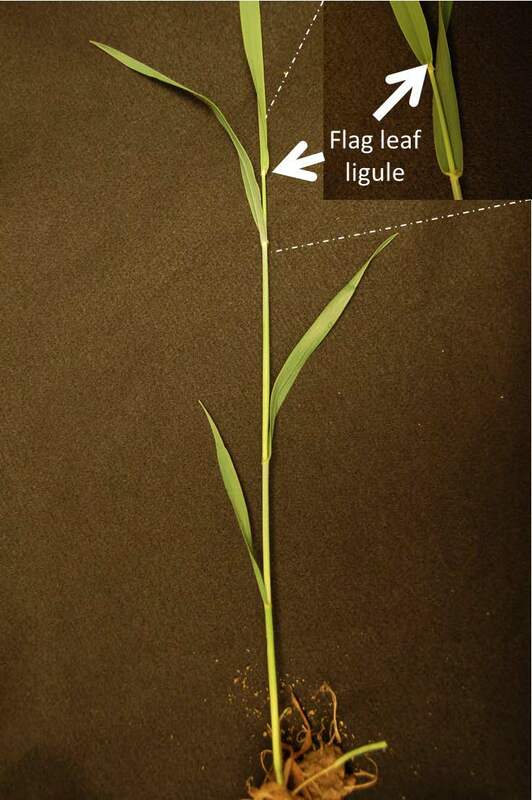 To confirm that the leaf emerging is the flag leaf, split the leaf sheath above the highest node. If the head and no additional leaves are found inside, Stage 8.0 is confirmed and the grower should decide whether or not to use foliar fungicides to manage early-season and overwintering foliar fungal diseases. Is a fungal disease present in the field? Is the variety susceptible or are weather conditions favorable (wet and humid) for rapid spread and development of the disease(s) found in the field? Does the crop yield potential warrant the cost of application of the fungicide in question to protect it? Is the crop under stress? If a positive answer applies to the first three questions, and a negative response to the last, plans should be made to protect the crop from further damage. Check product labels and apply as soon as possible. 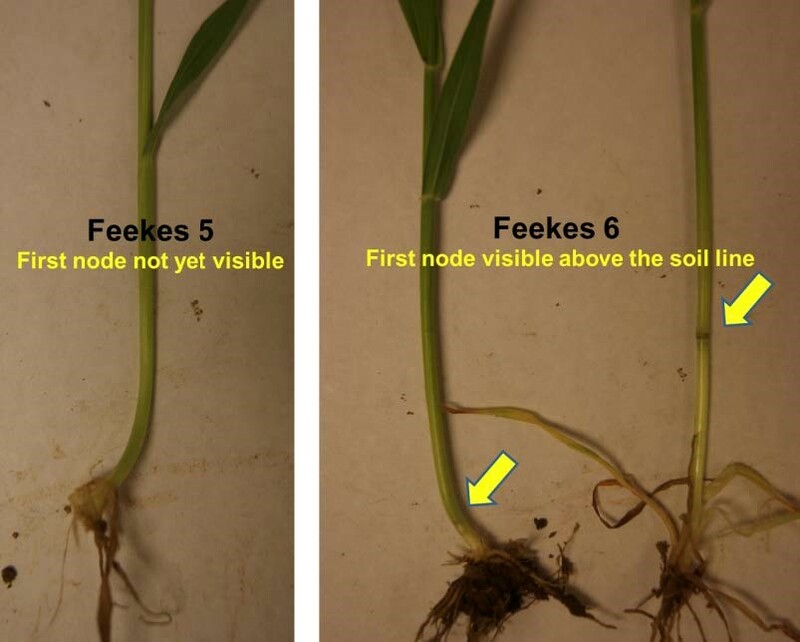 In most situations, the greatest return to applied foliar fungicides comes from application at Feekes Stages 8 through 10. Nitrogen applications at or after Feekes 8.0 may enhance grain protein levels but are questionable with respect to added yield. Moreover, additional N may increase the severity of some foliar diseases, particularly the rusts. Feekes 9.0- Ligule of Flag Leaf Visible: Stage 9.0 begins when the flag leaf is fully emerged from the whorl with the ligule visible. From this point on, leaves are referred to in relation to the flag leaf (i.e., the first leaf below the flag leaf is the F-1, the second leaf below is the F-2, and so forth). After the flag leaf emergences, army worms can seriously damage yield potential.